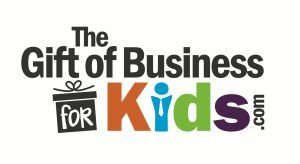 The Gift of Business for Kids™ is a very unique gift giving idea with lasting impact on children. We have innovated in providing a new category of gift ideas that that can be given from kids to kids, from parents to kids, from grandparents to kids and community minded people to impact children in their communities. We are trying to bring back the concept of a gift of time as one idea. It would be amazing if we could engage all kids in business by developing skills and experiences to help them succeed in life. By definition a gift is something given to someone without payment or a natural ability or talent. The Gift of Business for Kids™ combines both of these in an interesting way. The gift of business will also help a child understand and develop their natural abilities or talents. The Gift of Business for Kids™ us truly a priceless gift as you what the child develop for future success in business.